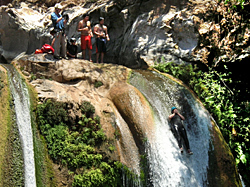 A Jalisco Vertical canyoneer rappels down the last (and biggest) of 12 waterfalls in Aquetzalli Canyon, after walking and swimming about two kilometers along the Jalpa River. 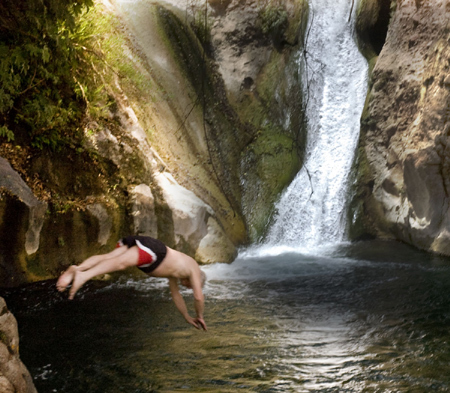 Emile Boudey enjoys a swim in the cool waters of the Comala Cascades. 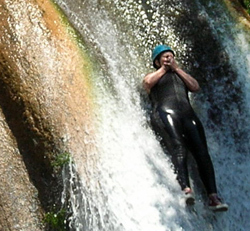 Laura Fantinello slides down “The Chute” of waterfall number two along the Jalpa River on her very first Canyoneering adventure.. "Brrr!" Everyone has washerwoman hands" on reaching the last of the falls in Aquetzalli Canyon. 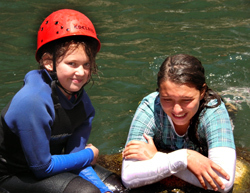 Meli and Xela Lloyd. High cliffs on the sides of the waterfalls provide convenient places to anchor ropes for Tarzan-style stunts. Photo by Adriane Mohl. "Finally, a decent place to write!" John Pint reports from Paradise using his portable Word Processor (also known as a clipboard). 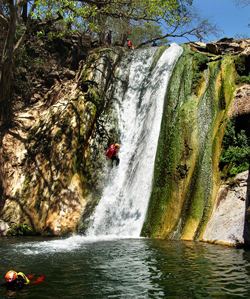 Recently my canyoneering friends—members of the group Jalisco Vertical—decided to rappel all the waterfalls of the Jalpa River as it passes through Aquetzalli Canyon, located 65 kilometers southwest of Guadalajara. Although I’m not a canyoneer, I decided to tag along hoping to catch up on my writing in full view of a spectacular cascade where I could periodically cool off in a deep pool of deliciously refreshing, clean water. After all, the word Aquetzalli, I was told, means “crystal-clear water” in Nahuatl. Canadian Chris Lloyd gathered together a group of around twenty people for the event, including several children and newcomers who had never “done” a canyon before. It took us two hours to drive from Guadalajara to a little bridge over the Jalpa River where the canyoneers would abseil down their first waterfall. 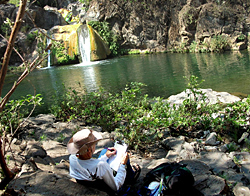 I then proceeded by car down to the end point of the river run, the three gorgeous waterfalls (each with its own deep pool) of Comala. It was a Sunday morning and I was amazed to find not a single person at these incredibly beautiful falls…it was, after all, the first week of June, probably the very hottest week of the entire year in this part of Mexico. I hiked to Fall Two with nature photographer Carlos “Charlie” Contreras. The scene in front of me was spectacular enough to be the backdrop for an exotic Hollywood movie: two cascades side by side rushing down a golden rock wall into a wide, deep, translucent green pool—and all for me alone, as Charlie had gone hiking upriver. I alternated between writing and swimming, figuring it would take the canyoneers all day to negotiate twelve waterfalls along two kilometers of river. To my surprise, less than three hours later my friends suddenly appeared at the top of the fall and were soon sliding down the natural chute or leaping into the pool from on high. We left with no explanation of the appellation Pigwater nor even a hint that here one could find spectacular—and nice-smelling—waterfalls that might make Hollywood film makers drool with envy. 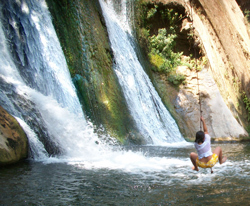 We never did find out where the name Agua Puerca came from, but rest assured, it does not refer to the magnificent falls southwest of the town, whose crystal-clear waters are clean and abundant all year round. 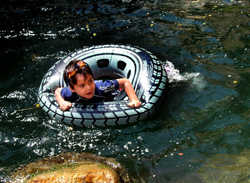 The high banks on the sides of these pools provide lots of strategic spots for diving as well as convenient points for anchoring ropes for swinging over the water Tarzan-style or for canyoneering. All in all, these cascades really do provide all the fun of a water park, without the plastic, and—for the moment—any charge whatsoever. Of course, there are no changing rooms, restrooms, refresco stands or other facilities, but all this may change in the near future, hopefully not to the detriment of the place’s natural beauty. If you bring along shoes that can get wet, you’ll have no problem crossing the shallow river below the first fall, to reach a rough trail on the other side which takes you to the next two falls and continues on upriver. I should also mention that a short distance downstream, you can find several convenient places for picnicking or camping alongside the river, under the shade of tall fig trees where you may see—as did we—a pair of noisy, chattering Cuclillos or Squirrel Cuckoos (Piaya cayana) frolicking above you. These gorgeous, long-tailed birds get their name in English from their habit of jumping from branch to branch like squirrels. 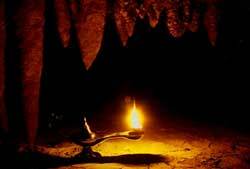 This is a great place to visit any time of the year, but at the height of the dry season, it's a must! Head south out of Guadalajara towards Colima. After 28 kilometers, be sure you get onto highway 80, signposted Barra de Navidad, which will take you through the towns of Villa Corona and Cocula. Thirty kilometers past Cocula, look for a sign saying Ayotitlán. Turn left here and drive southwest on a well paved road to Chiquilistlán. Just after the plaza, turn right onto Constitución Street and head southwest out of Chiquilistlán towards Jalpa. Ten minutes later (and ten kilometers) you’ll see a sign for Comala. Turn right. Only four minutes later you’re in Comala where, at N20 03.614 W103 55.791you turn left onto a steep, narrow, rough dirt road (high vehicles only) trending northwest. Follow it for two kilometers. You have to open (and then close) two iron gates on your way down to the falls and watch out for a Y at 1.3 kilometers past Comala. Bear left here. At last you must drive right across the Jalpa River, but it looks a lot worse than it is (as long as you’re in that high vehicle! In the rainy season, this might present a problem). 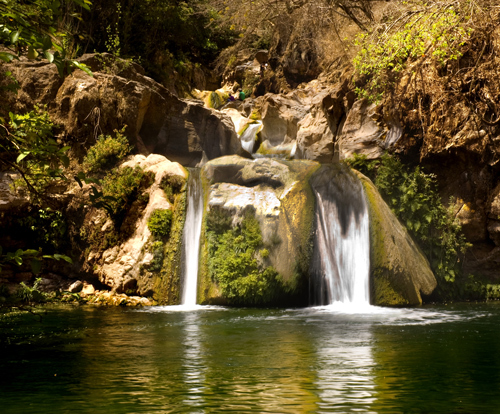 Three minutes later, you’ll be parking at the foot of the first waterfall, located at N20 03.241 W103 56.481. Driving time from Guadalajara’s Periférico (Ring Road): about two hours.